Apply now for the Walkley Award for Best Freelance Journalist for 2017. Open to residents of either Australia or New Zealand. The winner will receive a full pass to the Walkley’s Storyology Summit and two tickets to the Walkley Awards Gala Dinner. Previous winners include Yaara Bou Melhem, Andrew Quilty, Debra Jopson, Fiona Harari and Dave Tacon. Entries open till April 26. 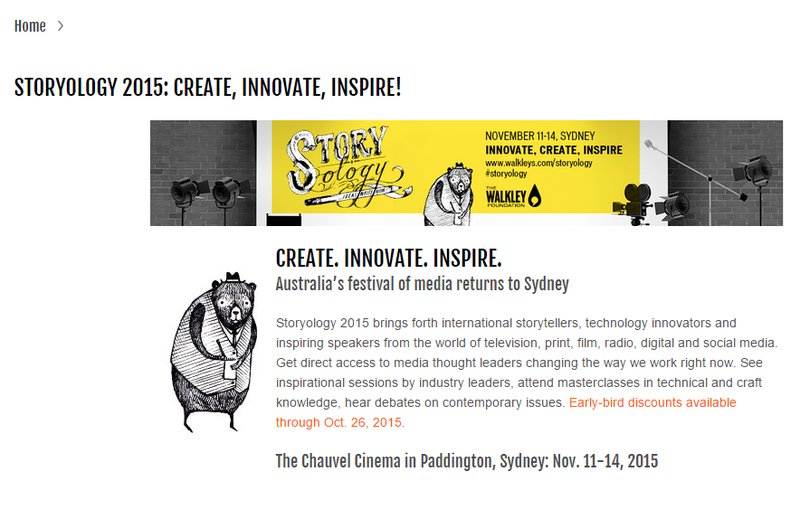 The MEAA’s annual storytelling and innovation festival starts November 11-13. The earlybird rate ends this Friday – you can save over $100 on festival tickets. Don’t miss this chance to explore the opportunities of the industry, inspirational talks and practically-focused sessions. A stellar lineup features Trent Dalton, Michelle Law, Matt Condon, John Birmingham, Rebecca Sparrow, and more. Congratulations to the three top Australian freelancers selected as finalists in the 2015 Walkley Award for Best Freelance Journalist of the Year. Fiona Harari, Andrew Quilty and William Verity. The overall winner will be announced in Sydney on July 29. This year’s awards attracted more than 60 top-quality entries, showing that freelance journalism in Australia is alive and kicking! The winner will receive $3,000 in prize money, a full pass to the Walkley’s Storyology Summit and two tickets to the Walkley Awards Gala Dinner. The Walkley Award for Best Freelance Journalist of the Year 2014 is presented by the Media Entertainment and Arts Alliance, with prize including $3,000 in prize money, a full pass to the Walkley’s Storyology Summit and two tickets to the Walkley Awards Gala Dinner. Entries open Monday May 19, 2014, and close at 5.00pm, Monday June 16, 2014. To qualify for the award, you must be an Australian citizen resident regularly engaged as a freelance journalist/photographer in any medium. Work submitted for entry must have been published, produced or broadcast in either Australia or New Zealand. Entries are judged on a work or a body of work (up to five pieces) published or broadcast between June 4, 2013 and June 16, 2014. Judges consider resources available and effort expended as well as newsworthiness; research; writing; production; incisiveness; impact; public benefit; ethics; originality; innovation; and creative flair. Three finalists will be announced on Monday June 30, 2014 and the winner announced on Thursday July 24, 2014 at an event in Sydney. All entrants will receive an invitation to attend the announcement. Entry costs is free for MEAA and EPMU members, and $295 including GST for non-members.